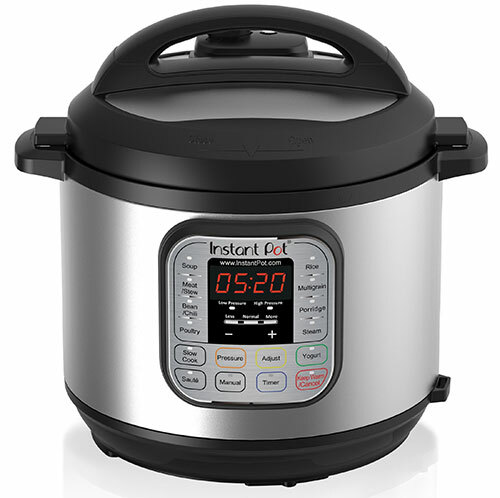 Instant Pot’s 7-in-1 Programmable 6Qt. 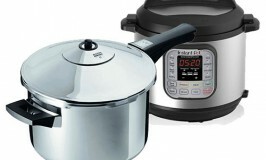 Stainless Steel Pressure Cooker is Amazons #1 Best Selling Pressure Cooker. Pressure cookers cook fast! Stews, Beans, and Roasts and other dishes are done in a flash with flavors and textures that are incredible. That’s why chefs will use pressure cookers when they’re under a deadline. Cooking under pressure works on a simple principle. In an open pot, water boils at 212°F (100°C), but in a tightly sealed and pressurized pot, the liquid won’t boil until the temperature is much higher. At a high pressure setting, water boils at about 250°F (121°C). This makes superheated steam which cooks the food much faster. Because your food is cooked under pressure, flavors from meats and spices are infused into your ingredients. Meats are juicy, very tender and delicious. Pressure helps vegetables to retain their vitamins, colors and flavors. It’s so easy to whip up a perfect meal when cooking under pressure. Pressurized cookers look like big sauce pans or stock pots. They have a rubber or neoprene gasket around the inside of the locking lid, which seals in pressure as the pot heats up. Because they’re sealed vessels, flavors are concentrated within the food, preventing them from escaping. Once an electric pressure cooker reaches operating temperature and pressure, it only needs a very small trickle of electricity to maintain that, and it does this automatically. Because your pressure cooker operates for a much shorter time, you use much less energy than conventional methods. Cooking under pressure really seals in the intensely wonderful flavors, and makes meats very tender. It’s really amazing what it can do in such a short period of time. Today’s Pressure Cookers are sturdy and have automated temperature settings built into them, so they’re really easy and safe to use. They’re convenient and versatile when time and counter space is limited, allowing you to create an amazing dinner in under an hour. You won’t realize how easy and even fun it can be, until you use an automated one. When boiling vegetables in water, all their nice flavors, nutrients, and even color runs out of them, but with a pressure cooker, it all stays condensed inside the vegetables, which is what you want when you’re cooking food. You want to taste those flavors and benefit from the nutrients. Your cooker will bring the temperature and the pressure up so that none of the flavors and aroma can escape from your ingredients. For people that are concerned with not having enough time for a home-cooked meal, a pressure cooker is perfect. Foods are tastier, more succulent, and more evenly cooked. 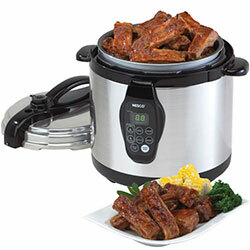 Visit our Home Page to see view the latest posts about using your pressure cooker.